1,800+ must-see movies on a beautiful and detailed road map to help you find your way through cinema. The perfect gift for movie buffs! 1,393 backers pledged €59,442 to help bring this project to life. Hi, my name is David and I really love movies. To me, watching movies has always been a journey, as well as a neverending quest. No matter how many you watch, there are still thousands more to discover. But the interesting part is that, one way or another, movies all connect to each other. I’ve always wanted to be able to render the history of film the way I saw it (see the best movies of all time map I designed back in 2009). There are more than 1,800 movies (see complete list) arranged on an imaginary roadmap with thematic rivers, forests, hills and lakes. 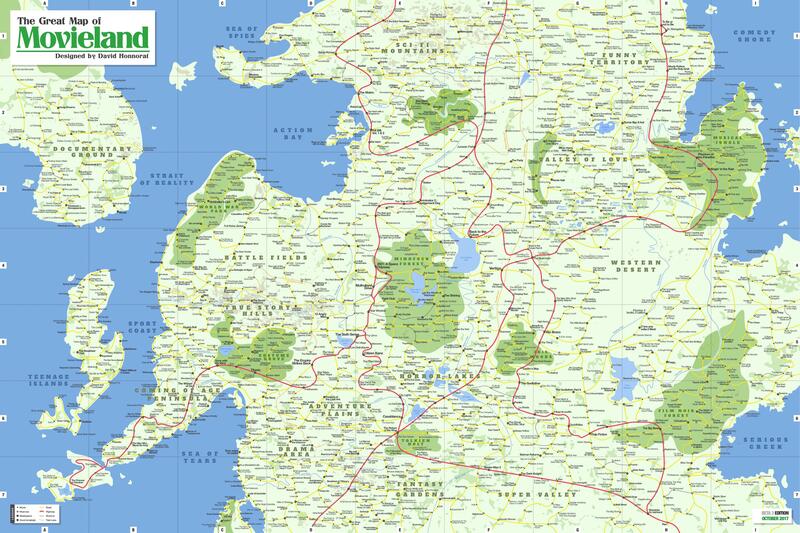 The map is so big, you need to see it printed on a giant 36x24" poster (91x61cm) to enjoy all the details. All posters will be printed in this size on a beautiful matte paper. Posters will be securely packaged in white craft paper and cardboard tube. There is so much to see in Movieland! Anyway, I spent approximately 300 hours designing of the map. I chose to work with Sketch, a wonderful vector-based design app. First because, as a UI designer, I feel very confortable using it, second because I thought it wouldn't have any problem to deal with thousands and thousands of elements, and it did not! While the number of movies was increasing it became more and more complicated to arrange everything coherently. But the challenge was very exciting. I finally added topography and vegetation before spending hours on improving micro details. If the campaign is a success, I'd love to go further with the project. My dream would be to work on some kind of a travel guide for movie buffs. There would be suggested itineraries and fun facts about the movies, and drawings and stuff... and also – obviously – a folded detachable print of the map included with the book. If you're a publisher and interested by the idea, do not hesitate to contact me. I would also like to travel and meet with cinephiles from around the world and discuss the movies featured (or not) on the map. Finally, the map could make a fantastic decor for theater halls or movie related places... would love to see it on very big walls! 31 year old cinephile designer based in Paris, France. I couldn't manage to list my own ten favorite movies, so I decided to arrange thousands on a giant map. Co-author of a critical analysis book (in french) about director M. Night Shyamalan. Film critic for magazines and podcasts. Big fan of Quentin Tarantino, François Truffaut, Howard Hawks, Pedro Almodóvar or Paul Verhoeven... Would probably say that Brian De Palma is the greatest filmmaker of all time. Printing and shipping will be handled by professionals. Shipping requires you to fill out your backer survey at the end of the project. The address must be accurate. Do not worry if there are mistakes, I'll contact you, or you can contact me. You just enjoyed the trip to Movieland? Join the community and you'll receive my eternal gratitude, as well as regular updates about the project. Unique signed edition with 5 movies of your choice added to the map!